I love holidays! I think they are so fun and there are so many fun activities to do in the classroom that go along with different holidays. I also love to give my team little treats throughout the year and especially on a holiday! Candy heart graphs are so much fun. I am planning to have my students complete this Candy Heart Graph and then they are going to pick two candy heart colors to add together and write an addition number sentence. I am going to have them do that on a sentence strip and then tape it on their graph. Just click the image to grab your FREE Candy Heart Graph! I also have some Valentine's Day Gift Tags for your students. They are in my Teachers Pay Teachers store for FREE. I bought some bubbles from Target and I am going to attach them to the tag. You could really attach any little gift to the tag or just give them the tag by itself! 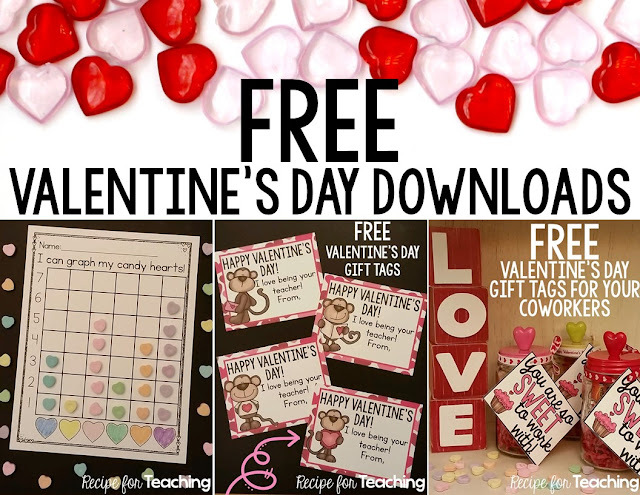 Just click the image to head over to my TpT store and download your FREEBIE. I mentioned that I love to give my team holiday gifts. I found the most adorable mason jars at Target for only $3 each! I put some red paper shreds in the jar and then filled it with a Reese heart and some Dove chocolate hearts - YUM! I attached a gift tag to it and TADA...a sweet Valentine's Day gift for my sweet teammates! Just click the image below to grab your FREE Valentine's Day gift tags for your coworkers. This week I had my students use some adorable heart buttons from the Dollar Tree to represent the dots on a domino. Then, they recorded the addition number sentence. My students LOVED these heart buttons. Those cute little heart tubs came from Walmart. You can grab that FREE domino recording sheet in my Domino Math blog post by clicking here. This Valentine Day Math Chat is part of my Valentine Math Pack in my TpT Store. I have done many Math Chats with my students this school year so I decided to have them work in partners to write about the Math Chat. I was so impressed with their work! You can check out my Valentine Math Pack by clicking the image below.